oo star directions obtained from a star catalog. In general, star sensors are the most accurate of attitude sensors, achieving accuracies to the arc-second range. This impressive capability is not provided without considerable cost, however. Star sensors are heavy, expensive, and require more power than most other attitude sensors. In addition, computer software requirements are extensive, because measurements must be preprocessed and identified before attitudes can be calculated (see Sections 7.7 and 21.3). Star sensors also suffer from both occultation and interference from the Sun, the Earth, and other bright sources. In spite of these disadvantages, the accuracy and versatility of star sensors have led to applications in a variety of different spacecraft attitude environments. 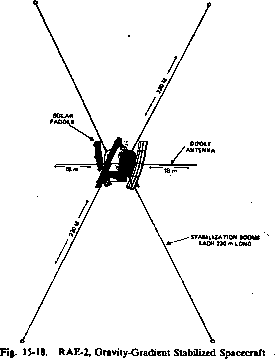 This section presents an overview of the operation and construction of star sensors and detailed descriptions of two representative sensors: the V slit Star Scanner used on the OSO-8 mission and the Fixed Head Star Tracker used on the SAS-3 and HEAO-1 missions and planned for HEAO-C and MAGSAT. Star sensing and tracking devices can be divided into three major classes: star scanners, which use the spacecraft rotation to provide the searching and sensing function; gimbaled star trackers, which search out and acquire stars using mechanical action; and fixed head star trackers, which have electronic searching and tracking capabilities over a limited field of view. Sensors in each of these classes usually consist of the following components, as illustrated in Fig. 6-37 for a V slit star scanner: a Sun shade; an optical system; an image definition device which defines the region of the field of view that is visible to the detector; the detector; and an electronics assembly. In addition, gimbaled star trackers have gimbal mounts for angular positioning. Stray light is a major problem with star sensors. Thus, an effective Sun shade is critical to star sensor performance. Carefully designed light baffles are usually employed to minimize exposure of the optical system to sunlight and light scattered by dust particles, jet exhaust, and portions of the spacecraft itself. Even with a well-designed Sun shade, star sensors are typically inoperable within 30 to 60 deg of the Sun.